Submitted by mahoney on Wed, 07/16/2008 - 11:25am. Texaco USA Including Alaska...Texaco is the name of an American oil retail brand. Its flagship product is its fuel, "Texaco with Techron". It also owns the Havoline motor oil brand. Texaco was an independent company until it merged into Chevron Corporation in 2001. It began as the Texas Fuel Company, founded in 1901 in Beaumont, Texas by Joseph S. Cullinan, Thomas J. Donoghue, Walter Benona Sharp and Arnold Schlaet upon discovery of oil at Spindletop. For many years, Texaco was the only company selling gasoline in all 50 states, but this is no longer true. Its logo features a white star in a red circle (a reference to the lone star of Texas), leading to the long-running advertising jingles "You can trust your car to the man who wears the star" and "Star of the American Road." 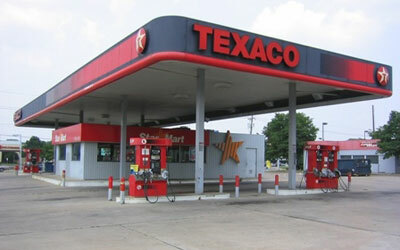 Texaco gasoline comes with Techron, an additive developed by Chevron, as of 2005, replacing the previous CleanSystem3. The Texaco brand is strong in the United States, Latin America and West Africa. It has a presence in Europe as well. NOTE: If there is a Texaco Gas Station in your area that I have missed please email me the location and coordinates and I will add it to the file. Updated the locations in Suwanee,GA. Added 4 and deleted 1. Deleted location in Clearfield,UT. It is now a Shell station. Updated the file using the latest website data. Added 166 locations, deleted 138 locations and removed 11 dupes. Added locations in Mapleton,UT, Orem,UT (3), Payson,UT and Spanish Fork,UT (3). Added 4 new locations: Alamogordo,NM (2), Vado,NM and Alpone,WY. Added a location at 1113 North Columbia Dr, Rincon,GA 31326. Updated the file. Net increase of 100 locations. Also file now includes those locations that have Diesel.